Happy Monday! And a belated Happy Mother’s Day to all the mamas and nurturers out there – hope it was an amazing day! We have been LIVING outside the last few weeks. After the worst winter in Seattle’s history, we were all juuuust about ready to lose our minds right when the sun decided to (mostly) start shining again. The kids run outside the minute they get home from school, and usually don’t come in until dinnertime. I have such great memories of being in my backyard as a kid growing up. My mom had the same philosophy – if the sun is shining, go outside – and I like to think it’s something I’m passing forward. Now many years later as an adult, I cannot stand to be indoors on a nice day. One of the things I actually love about living in Seattle is that it’s not usually quite warm enough to need air conditioning, and there are no scary or pesty bugs, which means we can leave our doors and windows open through the summer and have fresh air all day long. The best! Back home to get our beds cleared out, and our plants in the ground! In my three years of veggie gardening, I still feel like a bit of a newbie and haven’t gotten super adventurous. I like sticking with the things that do really well, and trying one or two new things each year. We turned all the soil and then laid everything out where we wanted to plant it. Then my helpers eagerly dug holes and set the plants inside. 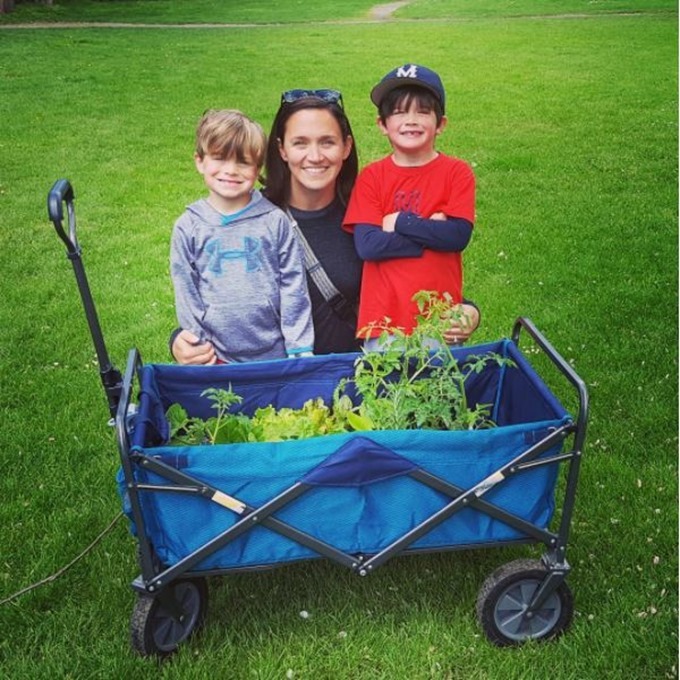 I look forward to gardening with them all winter long, and I love how much they love to be involved – from planting to eating! So here’s what we are growing this year! 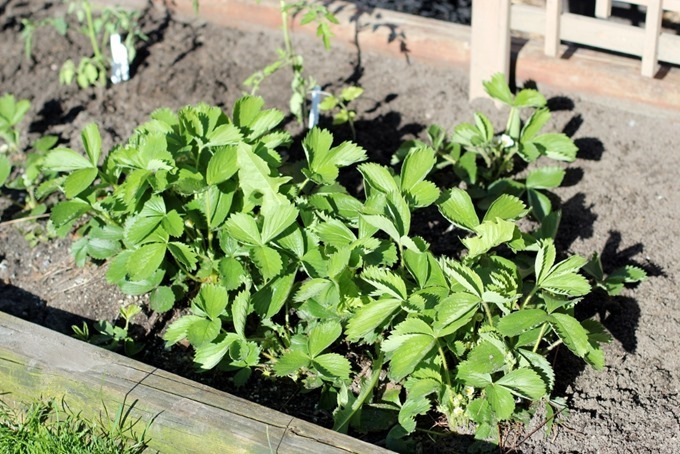 Our strawberries are doing really well ever since I moved them from pots to the raised beds in the middle of last summer. They have spread quite a bit already, and there are tons of little white flowers, which should mean lots of berries on the way! Behind the berries we did snap pea seeds, which is a first for me. They are already starting to sprout a tiny bit, which is so exciting! In the berry bed I’m doing my cherry tomatoes again this year. It’s my favorite thing to grow, and one of our most successful each year. For some reason the big tomatoes don’t do as well, but the cherries are always out of control. This year we planted a bunch of different colors and varieties – black cherry, sungold, a few reds, and one yellow. I CANNOT WAIT for caprese salad season! In this bed I’m also doing zucchini, which did REALLY well last year! 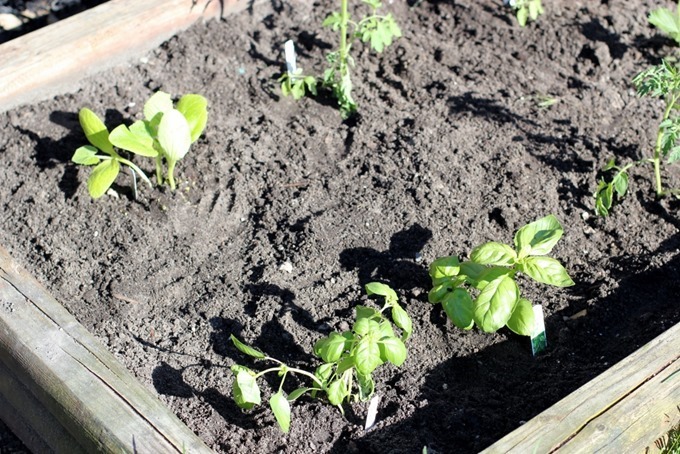 I’m moving basil to the garden beds this time too, as it’s never done very well in my herb boxes. Hoping it fares better in the beds. Any pro tips for successful basil growing? Mine always bolt or the leaves start mysteriously shrinking! So that’s garden bed #1, and it’s the one that gets the most sun, so usually the most successful. In our other bed, I’m trying Brussels sprouts for the first time. When I walk Indy each night, I check out the yards and gardens of all the houses on our loop, and I always see amazing Brussels sprouts stalks in late summer! Hoping we get some of our own this year. 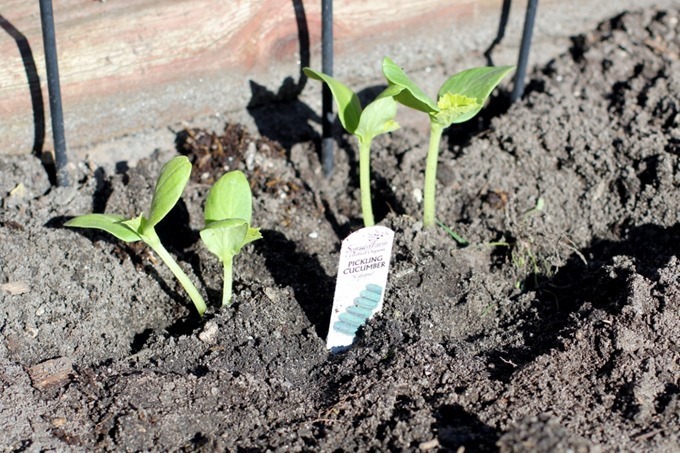 Behind the sprouts is our yellow squash plant, which was another big success last year. Looking forward to lots of zoodles! This is also where we are doing all our lettuce. I always go overboard with the salad greens, and this year was no exception. I tried to really choose varieties we love and eat this year though, so hopefully I can keep up with it. 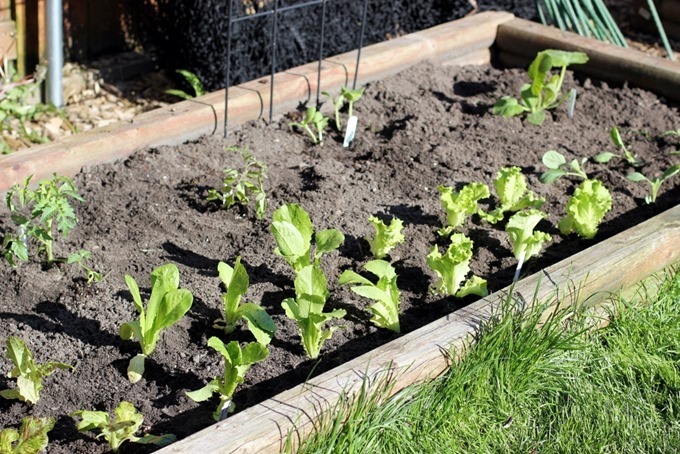 We planted crunchy romaine and soft butter lettuce – my absolute favorite! Trying cucumbers again this year and hoping they do a little better than last summer. They grew last summer but they were kind of spiny and small. Trying a different variety this year, so fingers crossed! A few more tomato plants in this bed because I just can’t help myself. You can never have too many tomatoes, right? I say that now but then these plants are massive by the end of summer and I always wonder what I was thinking. Outside of the garden beds, I’m trying to keep everything else in our yard alive. I bought these amazing perennial ornamental oregano baskets last year, and they are just now starting to come back. I hope they grow quickly so they aren’t so short and stubby all summer long! These had gorgeous purple blossoms at the end of last summer. I’m hoping these actually come back well so I don’t have to keep buying new hanging baskets each year! 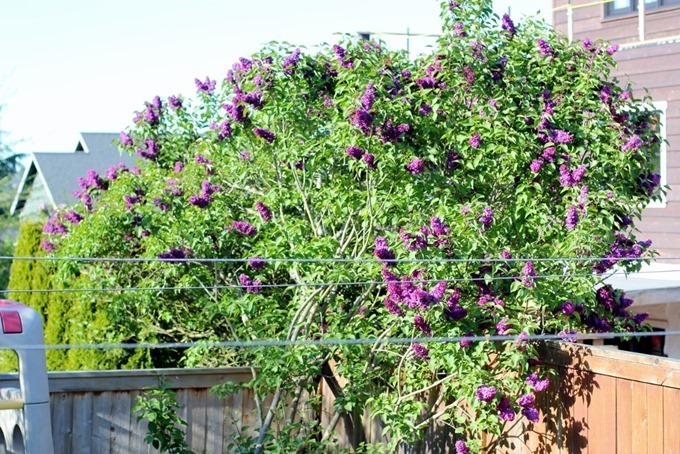 Our lilac tree is in full bloom, and the yard smells AMAZING. I just cut some blooms to bring inside yesterday – the purple color is just gorgeous. We almost had this tree taken out last year, since half of it split and fell in a storm last spring, and the other remaining half is leaning on our fence. I ended up deciding to wait and thank goodness I did, because there is a hideous construction monstrosity going up behind it, and this blocks a lot of it from our view. 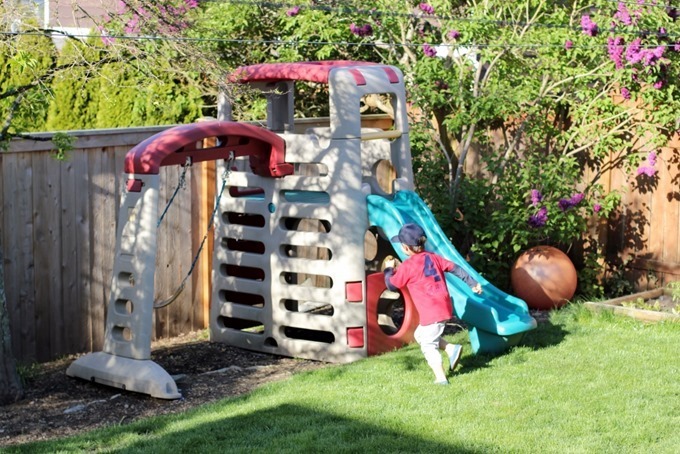 So many new boxy houses popping up everywhere in Seattle – it’s nuts. 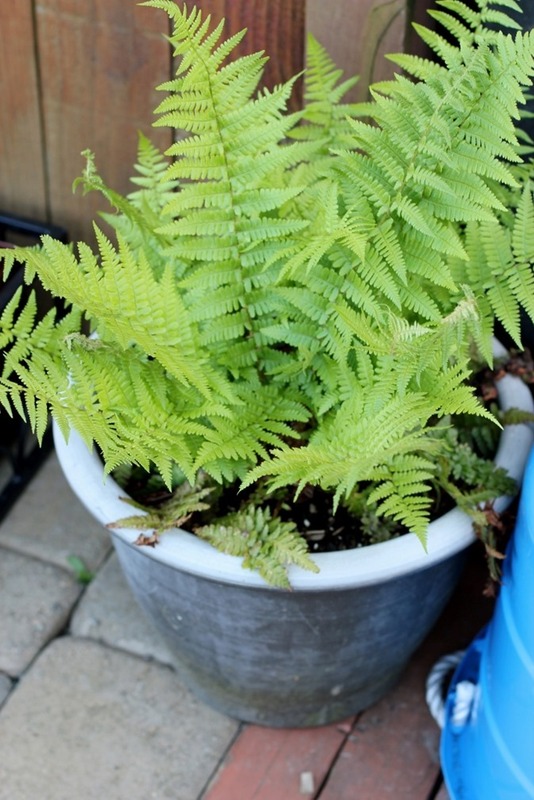 The ferns I planted last year are doing really well and are a nice pop of color on our deck. I’m excited that these have gotten so big in just one year! And our Huey tree just finished blooming again. 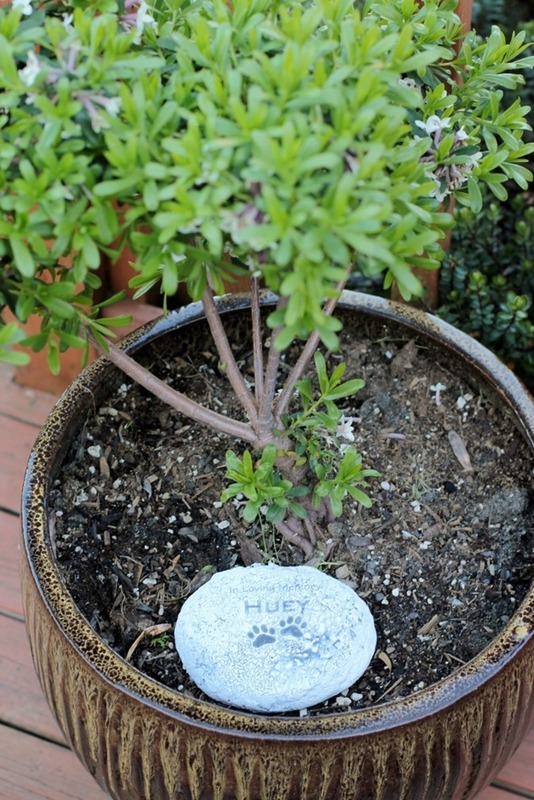 I love that it flowers right around the time that we lost him last year (mid-March). Still missing that old nut every day. In other backyard news, one of our friends is moving out of the neighborhood (SOB) and didn’t have room for this amazing climber in her new yard, so she gifted it to us! The perks of having a pick up truck and easily transporting big obnoxious play equipment! 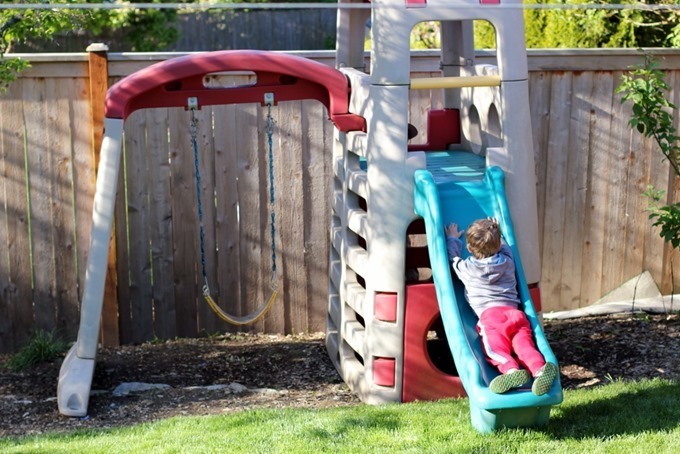 The kids have been playing on it basically non-stop, and it’s a big step up from our old tiny playhouse and toddler slide (which I gifted to neighbors on our Buy Nothing group). Our next door neighbor has been over almost every afternoon to play too! It’s not the prettiest thing ever, but I’m definitely in the camp where I’d rather just have a fun yard where kids love to play than a perfectly manicured lawn and fancy furnishings. I love having a great outdoor space for all of us to enjoy! We are hanging and planting some window boxes this week, and finally strung up our outdoor lights last night, so I’ll share some more pics soon. The weather for next week looks like it will hit the EIGHTIES, which is kind of blowing my mind. Nothing better than a Northwest summer, and I am so ready! What are you guys gardening this year? Any tips or tricks for the plants we purchased? Next Post » Beat the Bridge 8K 2017! Hi, French reader here! This is not a tip to grow basil per say, but it’s a basil-related tip, so I thought I would share it anyway : plant your basil next to your tomato plants, and your tomatoes will end up being (slightly) basil-scented :-) Also, basil + tomato plants is a good association if you’re into permaculture. Love your blog, even if the last and only time I left a comment was several years ago! You’re garden is very close to what I’d like to plant! We moved in last year and most of our backyard is extremely shady. I’m putting a 4×8 box along the side of ten garage and hoping to learn what works this year. 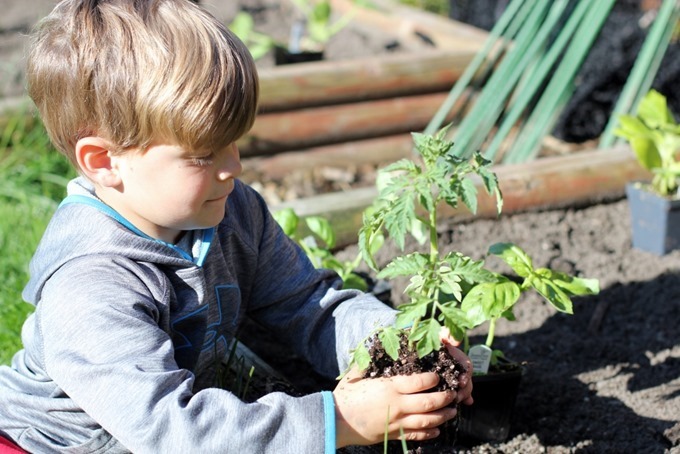 How did you learn how close to plant things, especially tomatoes? Any resources you can share? I did a bit of searching and saw different spacings, and some look quite limiting. Yours looks great! Autocorrect is not my friend today. I love your back yard and you make me want to garden so much. I’m not great at growing things and our 14 month old has already dug up 3 of my potted plants so I hesitate but your post makes it so tempting! We have a weed barrier and love it! It’s black fabric that is organic. It lasts a long time (10+ years at this point). We got ours from Gardens Alive. What a beautiful garden! 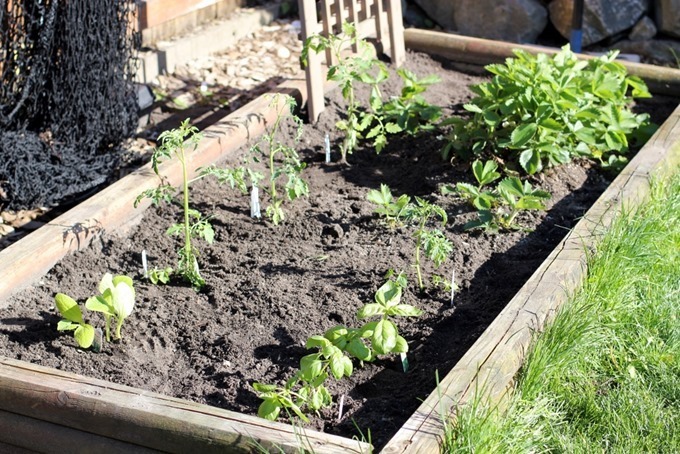 I really intended to start a garden this spring, but sadly it’s looking unlikely – the past month has been super busy and I have no clue about how to garden so need to put some serious time in. Luckily I live in Texas and there are plenty of things that can grow in Fall and Winter too, so hopefully I’ll get it going before next spring! I grow a lot of basil and the key (at least for me) is to continually pinch off new shoots every week before they bolt into flowers. When you do this, they will actually start another shoot and you’ll get a bushier plant with more basil rather than a tall one that bolts and will turn bitter. I love Calikim’s and MIGardner’s You Tube channels and have gotten so much good information from them! Here is Calikim’s link about propagating basil plants: https://www.youtube.com/watch?v=IVjCh28QYsA She shows you exactly how to pinch it off and make new plants! Tomatoes need to be spaced about 2 to 3 feet apart, even 4 feet apart, to allow for proper air circulation which reduces disease in the plants. Our basil failed when we didn’t use it enough! To keep it from bolting I learned to regularly take snips from it. That playground looks awesome! Perfect size and underneath the slide looks like an awesome clubhouse/hideout! Looks like you planted pickling cucumbers, which are just as you describe (spiny and small) vs slicing cucumbers that are better for slicing and eating fresh. 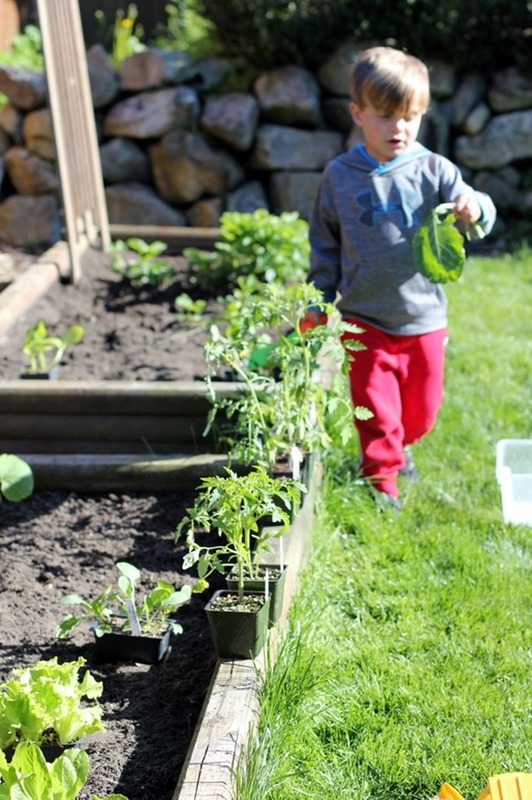 I love freshly-planted gardens and dreaming about all of the produce to come! I never had luck with basil in pots so I now plant it in the garden with my lettuce and I get big, full basil plants. Good luck! As it turns out basil is a companion plant to tomatoes. They love to grow near each other! This year we are growing a variety of things but I’m most excited about planting ground cherries again! They are so tasty (a cross between a strawberry flavor and pineapple flavor). What an awesome setup! I’m definitely envious. I was buying flowers this past weekend to plant in my containers and realized that, more than anything, I just need an actual house and a yard, not an apartment with a porch, if I’m going to be able to do all the gardening I actually want to do haha. In the mean time, I’ll just keep buying more and more containers to hold me over. No room for veggies in the containers, though – that’s what I’d really like to try growing someday! Congrats on getting your garden in! 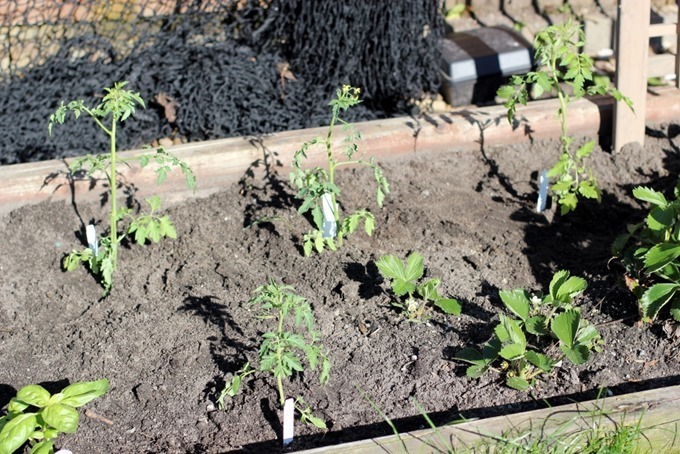 With baby due in July we are slimming down our garden goals this summer to tomatoes and beans. Your gardens look great! I’m no expert but I love growing veggies. 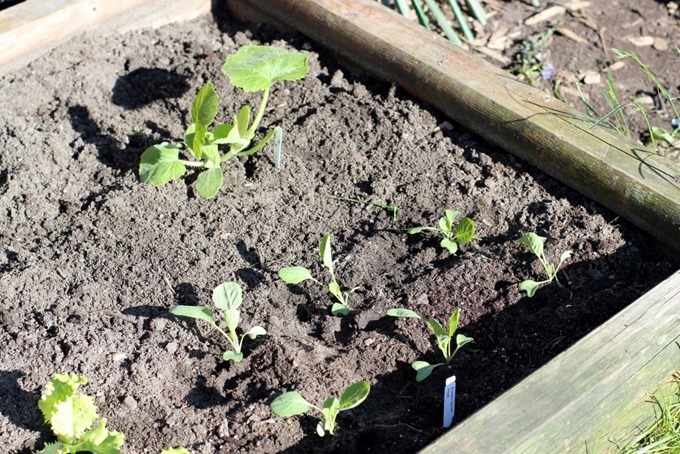 Your peas will need a trellis or cage to climb. We grow sugar snap peas and just use tomato cages. Another super easy thing to grow (at least here in MN) is carrots. Green onions are another easy one. I tried my lettuce in big pots this year. I hope it does ok! I am jealous! Your garden is awesome! I live in South Florida and it is just too hot for almost everything. I can grow herbs and kale but everything else just burns in the sun. I’m attempting strawberries for the first time this year and read that it can be (but isn’t always!) problematic to plant in the same bed as tomatoes. Not sure how valid this is but something to consider for next year if you have any strawberry issues! I have had success with basil in containers but I clip it ALL the time to keep it from bolting. I cut down my oregano almost to the dirt in the winter and it is grows taller and taller each day. I have a different variety than you, but I have always read that in general, oregano comes back very well during the spring/summer. 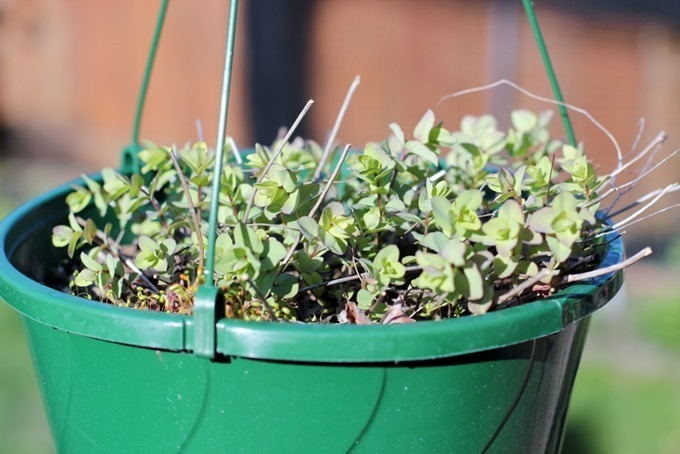 And it takes over whatever space you give it so keeping it in a pot/hanging basket by itself is a good idea! Looks like you are going to have lots of good eats this summer! What brand is the new playground? Looks perfect my kids’ ages (close to your boys!) Thank you. My basil plant already died 2 weeks post planting. Sad! My mom always gets them to like 3 feet.?!? Btw has a short Seattle layover yesterday, I looked for your kombucha there but haven’t made it in the airport yet I guess, someday :) too bad, I was curious. Very nice. 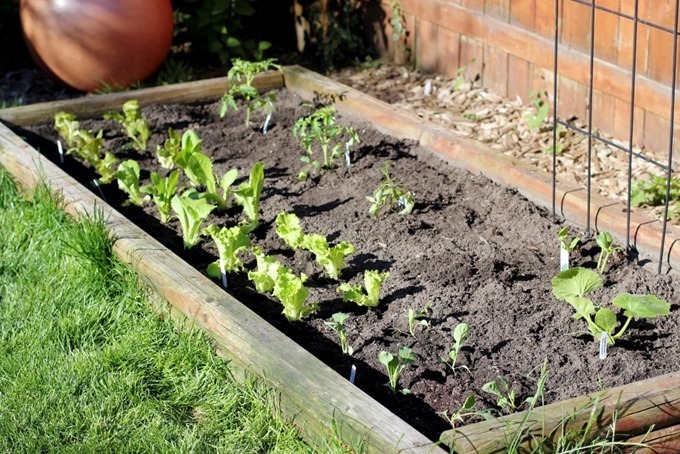 Would love to see how your garden progresses through the summer! We just finished planting ours. Lots of swiss chard (the best green ever!) and better boy tomatoes. Picking the basil often should help prevent bolting. But that’s the part of gardening I always struggle with – harvest. It can be so easy to get wrapped up in keeping the plants alive that sometimes I forget the point is to eat them! This is me too! Obsessed with watering and taking care of the plants, but then they all bolt because I don’t eat them fast enough! So silly.